This dispatch is from our Cambodia railway correspondent, Abigail Gilbert. After a wait of 14 years, passenger trains are once again running in Cambodia. Train buffs will need no other excuse to get on board, but there are good reasons why any traveler might like to let the train take the strain. Taking the train in Cambodia. Yes, they’re back! 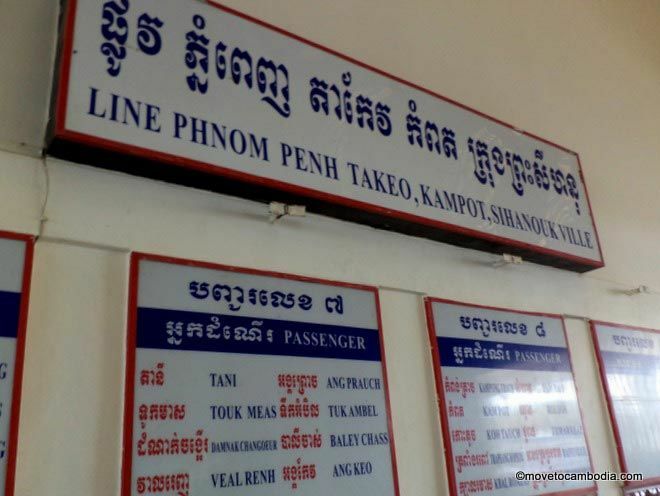 Although plans are in the works for a country-wide network, the train service is currently limited to four destinations, running from Phnom Penh via Takeo and Kampot, terminating in Sihanoukville. 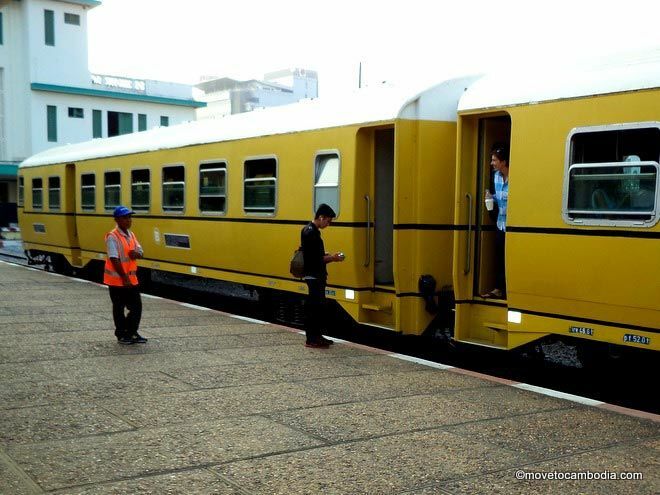 This first foray into passenger trains runs only on weekends and public holidays, matching domestic demand for the two popular Khmer holiday destinations. Two trains alternate on the tracks — the Yellow Train and the Blue Train. The seating set-up is slightly different (sideways or front-facing), but both trains are air-conditioned and tickets are the same price. Given that the rolling stock is refurbished from the 1960s, the experience is more modern than you might expect. Carriages are air-conditioned, the padded vinyl seats are newly upholstered and the ride is surprisingly smooth. The toilet is clean and well provisioned — a bum gun, paper towels and the ubiquitous Glade air freshener. Announcements are made in Khmer and English by a man in a high-vis jacket with a portable karaoke machine, bringing a personal touch to customer information. Lingering suggestions of the original train — pull-down windows, French language plaques, oscillating ceiling fans and stencil-punched seat numbers — will please lovers of retro train chic. The train stations, shabbily delightful hangovers from Cambodian history, are also worth a second look. Any journey in Cambodia seems to be an excuse to eat. On board the train, the ever-smiling assistant in her Royal Railways baseball cap serves up instant Mama noodles and bottles of water to your seat on request. Passengers can stock up on boiled eggs, cut pineapple and mango, dried fish, and iced coffee at the station stops, which are usually about 10 minutes each. The Cambodian countryside from the window of the train. Apart from the novelty value, the biggest attraction to riding the train in Cambodia is what you see out of the window. From Phnom Penh, the train slowly chugs through communities which set up around the tracks when the idea of a reestablished train service was only a daydream. Reach out a hand and you could grab the laundry off the balconies. Vendors wait for the train to pass so they can set up their stalls again, kids on doorsteps wave or put their fingers in their ears, grandmas perched at a noodle stall watch the passing carriages. Within half an hour, the train is tooting through semi-countryside, startling ducks into making a waddle for it to their lotus pond. Arriving in the countryside proper, there’s a picture postcard view of Cambodia — wooden stilt houses sheltering under palms, surrounded by paddy fields stretching back to crenelated hills. At small dusty crossings, motorbikes and oxcarts wait at the nominal red and white striped barriers. 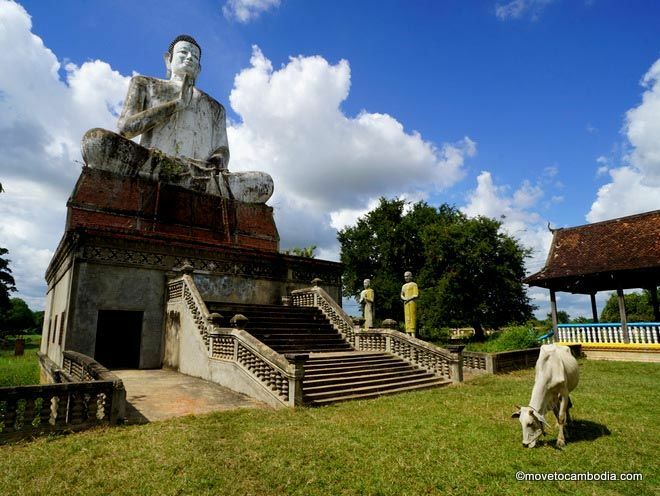 Closer to Kampot, limestone karsts shoot up from the flat landscape while white Brahman cows and water buffalo stare transfixed at the train. This is a perspective you don’t quite get traveling by road, either because you’re going too fast or you have your eyes screwed tightly shut! The railway station architecture is outstanding. This is the Kampot station. Getting out of Phnom Penh by road at any time of day except very early morning is generally a hassle, due to the volume of traffic. Phnom Penh train station is centrally located, easy to get to, and the train cuts through the suburbs more quickly than buses or taxis. A Royal Railways sign at the station informs passengers “Never boarding late as the train never waits anyone.” So far, the service has proved to be pretty reliable, more often arriving early than late. Unlike buses, which often make a frustrating number of stops to pick up passengers or drop off bags of mangoes, the train is direct. Whilst the average speed is somewhat slower than road vehicles, the train travel time compares favorably with similarly priced buses (4.5 hours to Kampot, another two hours to Sihanoukville). If speed is of the essence, the more expensive Giant Ibis buses or a private taxi will likely get you from Phnom Penh to Kampot more quickly, if more queasily. The road to Sihanoukville does not have the best record for traffic safety — frequent travelers expect to see an accident on almost every journey between the capital and the beach. By traveling on the biggest vehicle around, one that doesn’t engage in impossible overtaking maneuvers on blind corners, you’ll probably feel a bit safer. 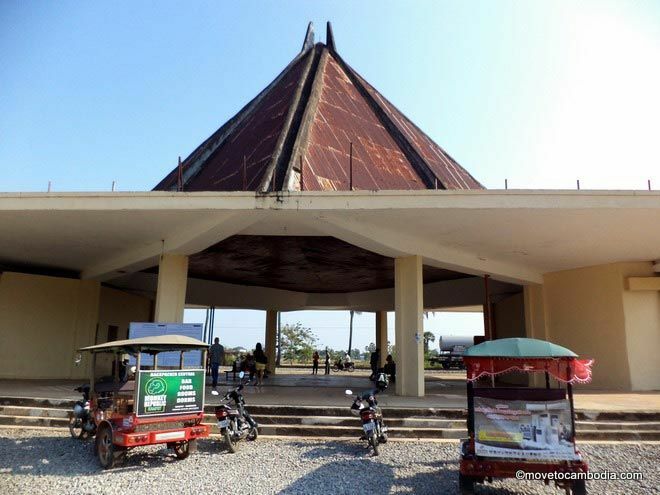 And you can avoid the traffic; some journeys from Phnom Penh to Sihanoukville can be as much as seven hours by bus depending on what time of day you leave. If you fancy taking your own transport with you, motorbikes and bicycles can be transported on all trains for a $5 fee, and cars can catch the Blue Train for $14. The ticket office at Phnom Penh station is open 8 a.m. until 4:30 p.m. Monday to Friday, and 6 a.m. to 12 p.m. on Saturdays and Sundays. You can also call 078 888 583 during the same hours, but the easiest way to buy a ticket is in person. From Sihanoukville, Kampot or Takeo, enquire at the station. The Friday train is generally less busy than the Saturday and Sunday journeys, but it’s best to buy your ticket a couple of days in advance to be sure of being able to travel. For public holidays, the earlier the better, as trains only carry around 100 passengers each. Scheduled train times are as follows, but do check at the station — timetable alterations may be made as this new service develops. 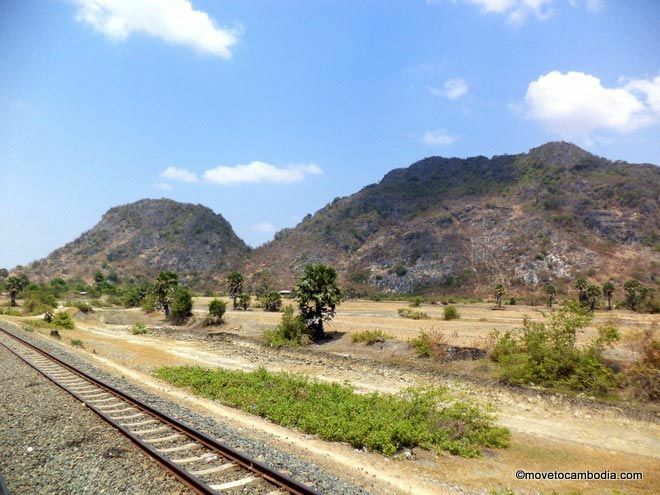 For now, the train goes from Phnom Penh to Takeo, Kampot, and Sihanoukville, but there are plans to expand the network. Phnom Penh 3 p.m., Takeo 4:30 p.m., Kampot 7:40 p.m., arrives Sihanoukville at 10 p.m.
Phnom Penh 7 a.m., Takeo 8:30 a.m., Kampot 11:40 a.m., arrives Sihanoukville at 2 p.m.
Sihanoukville 7 a.m., Kampot 8:40 a.m., Takeo 11:50 a.m., arrives Phnom Penh at 2 p.m.
Sihanoukville 4 p.m., Kampot 5:40 p.m., Takeo 8 p.m., arrives Phnom Penh 11 p.m. There is now expanded holiday coverage. Check out the train schedule for 2016 holiday service. Royal-railway.com is the official site of Royal Railways, with limited information. 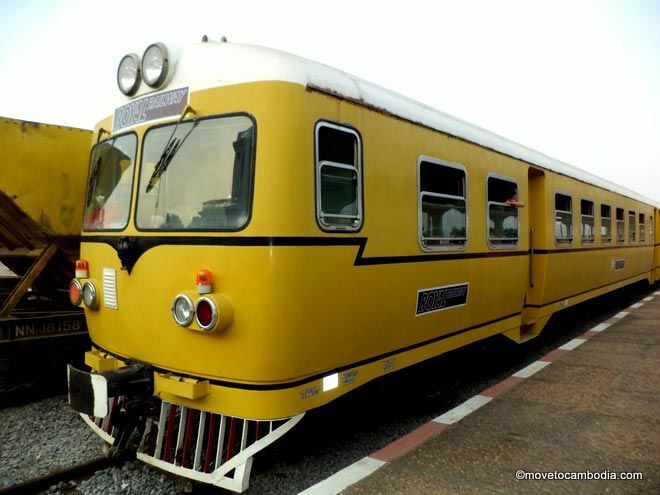 An unofficial site, traincambodia.com has more information. There’s a Facebook group, Train Cambodia, where railway enthusiasts convene to exchange info and answer questions. Accessibility Note: Due to steps and the height difference between some platforms and the train, those with mobility issues may find getting on/off the train a bit of a challenge. 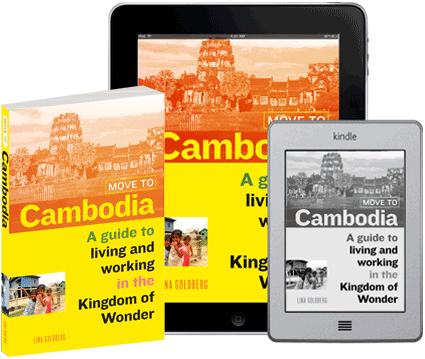 Heading to Kampot or Sihanoukville? Check out our city guides for where to stay, what to do, and the best places to eat. This entry was posted in Transportation and tagged Cambodia trains. Bookmark the permalink. It would be useful to know the address to the train station at Phnom Penh, and other locations?! And if your fingers or voice works, you could’ve sent the address. Some cities have seperate train stations for freight and passengers, as does PP. BTW, one can take a train to Battambang and all the way to Poi Pet, the border town to Thailand. And from there another train from Thai border side to Bangkok. Currently, north of Phnom Penh tracks are closed for maintenance, thus no passenger train. Trains run now Friday, Saturday, Sunday, Monday. On public holidays also Tuesday and Wednesday. Departure Times in Phnom Penh are either 7AM or 3PM or 4PM.